NameSummit 2018 gathers together digital branding influencers and experts, including Katie Garrett, to share their knowledge and exchange ideas with attendees on Nov. 5 and 6 in New York City. 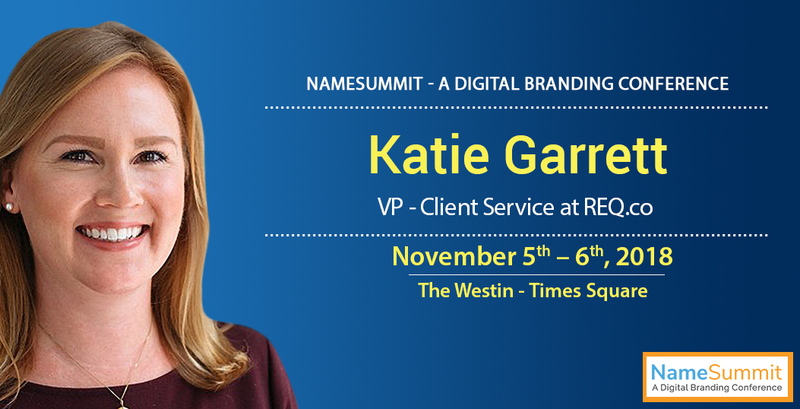 Katie Garrett has agreed to participate as a speaker at NameSummit 2018 being held at the Westin Times Square Hotel on Nov. 5 and 6. Ms. Garrett is senior vice president for client marketing at REQ, a brand management and digital marketing company. She is a past president of the Washington, D.C., chapter of the Society for Marketing Professionals and is co-chairman of the Community Action Committee of Commercial Real Estate Women. Ms. Garrett will join a panel of industry experts discussing tips and techniques for improving search engine optimization to increase visibility and to drive traffic to a website. Those attending the Monday afternoon panel presentation should come away with proven methods for improving a website to increasing website-generated leads.